One of the most popular and widely used open source software, WordPress has been a favorite target for hackers since it started gaining recognition. And, with the ever-increasing user base and its position as the world's most dominating CMS hardening, will only increase the risk of WordPress sites of being hacked. Considering this fact, it's imperative that we should concentrate more on keeping WordPress websites protected against security exploits. Thankfully, there are several techniques and tools available over the web that can help you harden your WordPress site's security. In this post, however, we'll understand about two factor authentication process and how it can help in improving WordPress website security. What Exactly is Two Factor Authentication? Two-factor authentication, just as the name implies, is a process that asks users to perform two steps of authentication before they're logged into a WordPress website. One of the most common ways of using two factor authentication is that you'll be required to enter your login credentials – username and password – first, but there will be another step that you'll have to complete before getting logged in. The second step usually requires confirming your identity by asking you to enter some verification code sent to your phone or tablet. The two factor authentication is one of the most highly preferred ways of strengthening the security of a WP site from vulnerabilities; this can be attributed from the fact that it is used by many niche brands such as Google, Amazon, etc. Below is a YouTube playlist compiled by us to learn basic concept of two factor auth and why do we need it. Is Two-Factor Authentication a New Concept? While some people may think of two factor authentication as a new concept, but in reality it is already being practiced by most of the users. For instance, showing your ID when paying with a credit card is a form of two factor authentication. In addition, entering your zip code when making a purchase online also requires you to follow two sets of authentication. So, as you can see, two factor authentication isn't something new. The only difference is that it is now used in a new way: using an app to login into a site is kind of a new experience. In fact, this has encouraged users to adopt the two factor authentication technique for keeping their site secure. Why You Need Two-Factor Authentication Anyways? As discussed previously in this post, two factor authentication helps add an extra layer of security which is crucial to safeguarding your WordPress site from increased brute force attacks. Malicious users launch brute force attacks regularly, and so it's necessary that your site is secured enough to prevent such attacks. But, a smart hacker might break into your site and steal your sensitive information, or might upload malware in it. But once you have implemented the two factor authentication technique, it will make it difficult for hackers to trespass your site. And if you aren't running some popular WordPress website, hackers and malicious users are likely to back down from trying to break in after some time. 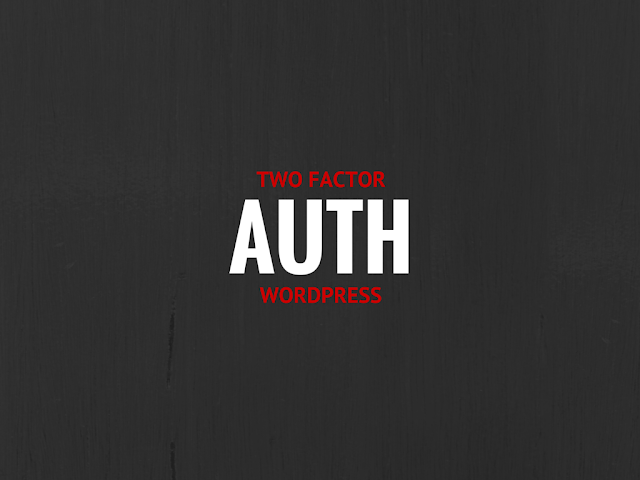 What Are The Options to Implement Two Factor Authentication in WordPress? As you may know, WordPress plugins can help add almost any sort of functionality in your site. And, you can even find plugins that enables you to setup two factor authentication in your website without much hassle. Once you've installed and activated this plugin in your WordPress install, it will make users enter a One Time Password (aka OTP) when they try to log into your site. No matter how weak your website passwords may be, a user won't be able to access your site without having access to the OTP – that a user receives either on the mobile phone or in an email inbox. This is one of the simplest ways to add two factor authentication on your site. Duo Two-Factor Authentication plugin helps add two-factor authentication for your website administrators and/or users in a breeze. In order to make this plugin work: you first need to install and activate it on your website, and then download Duo's app on your phone that generate one time passcodes – that is needed to gain access to the website. This plugin helps in adding Google Authenticator app to a WordPress website to enable two factor authentication on not just sites but application (like Gmail, Dropbox, etc.) as well. The best aspect about this plugin is that lets you enable or disable the two-factor authentication feature based on a user's preference. The plugin comes with an app password feature by default. But, avoid using this feature as it can make your blog less secure. Last on our list of two-factor authentication plugins is Clef, another great option for implementing an additional layer of security to your site. The plugin is based on a unique approach compared to other plugins: it helps ensures strong authentication without having to use any passwords/tokens. To use this plugin, just install the Clef mobile app using which you need to sync with the Clef Wave. That' it! Now you can sign into any website with just a single click. What's more? You can even log out from the site automatically by setting the timer. Observing the continuous increase in attacks on WordPress sites, it is important that you're following methodologies and making use of available resources that can help harden your WordPress site's security. There are some great techniques to achieve such an objective, most importantly, enabling two-factor authentication seem to be the best and highly efficient ways to avert unauthorized access. In fact, two-factor authentication proves a good security practice, especially for protecting sites from brute force attacks. You can quickly add two-factor authentication to your website with the help of plugins such as the ones mentioned in this post. Make sure to study each one of the plugins carefully and select one that best serve your needs. Sophia Phillips has been working as a professional in WordPress theme customization company and loves sharing information about leveraging multiple benefits of WordPress in the best possible manner. Currently, she has an impressive count of WordPress - related articles under her name.